The most delicious use for stale bread ever! 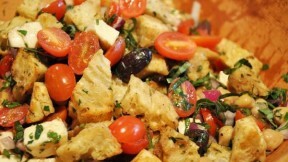 Prepare the croutons in advance and the panzanella comes together in a flash. A perfect and satisfying hot weather meal. Use only fresh mozzarella in the salad, not the kind you’d use in lasagna. To make a meal out of the salad, add tuna or hard-boiled egg. For croutons, cut the crust off the bread and cut bread into cubes. Let the cubes dry out a bit. Mix together the remaining ingredients and toss with bread cubes, then lay them out on a baking sheet. Bake in a 350-degree oven until they begin to brown, at least 10 minutes. Cool croutons before adding to salad. For dressing, put all ingredients except olive oil in a food processor. Leave it on for a couple of minutes for garlic to incorporate (and you won’t have chunks of garlic in your dressing), then slowly add olive oil so it emulsifies. For salad, combine all ingredients in a large salad bowl and toss with the vinaigrette. Add cooled croutons and toss again.